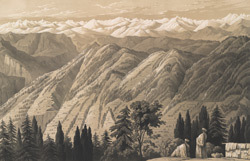 This lithograph was taken from plate 12 of 'Views in the Himalayas' by Mrs WLL Scott. The view was made at the staging bungalow at Narkhanda, 8,800 feet above sea level. Staging bungalows were used as resting places on the journey through the mountains. The two figures in the foreground are part of the team who carried Mrs Scott in her carrying-chair, a type of uncovered palanquin. Present day Narkhanda has been made into one of India's few ski-resorts.